Laser Distance Sensor detects clear objects. Featuring default clear object detection mode setting, Model Q4X eliminates 2-point, dynamic, foreground, and background suppression mode. Without requiring retro-reflector, sensor combines window thresholds on both target distance and target reflected intensity.Â Bright readout on angled 4-digit display enables viewing from multiple vantage points, while FDA-grade stainless steel housing rated to IP67, IP68, or IP69K allows use in wet and high-pressure washdown environments. Minneapolis, MN – Banner Engineering’s industry-recognized Q4X laser distance sensor is now available in models exclusively designed for clear object detection. Featuring a default clear object detection mode setting, the Q4X clear object model eliminates two-point, dynamic, foreground and background suppression mode. Without requiring a retro-reflector, the Q4X sensor combines window thresholds on both target distance and target reflected intensity, allowing the Q4X to reliably solve clear object detection applications such as thermal formers, blow molding, bottle filling, bottle handling, shrink-wrap packaging, and bottle, jar or tray detection. 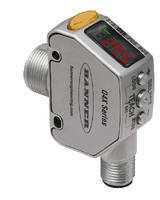 For more information on the Q4X laser sensor, visit www.bannerengineering.com. About Banner. Banner Engineering is a world-leading manufacturer of photoelectric and ultrasonic sensors, indicator lights, vision sensors and vision lighting, electronic machine safeguarding systems, wireless networks, fiber optic assemblies and precision measurement systems. For further information, contact Banner Engineering Corp., 9714 Tenth Avenue North, Minneapolis, MN 55441. PH: 888.373.6767 (Toll-free North America), or 001.763.544.3164 (International). FAX: 763.544.3213. E-commerce: www.bannerengineering.com/buyonline. ImageXpress Pico Imaging System performs both imaging and analysis. Aquilos FIB/SEM System is used for tomographic imaging. Infrared Camera includes FireWire digital output.